Fall means pumpkin activities! Working on homeschool preschool lessons has been great because our ability to incorporate a variety of learning activities has been really exciting! 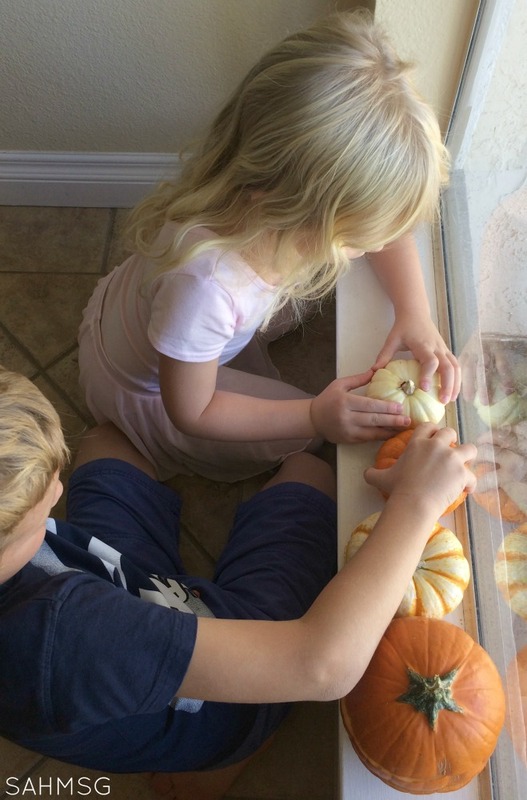 I always enjoy the season of Fall and try to incorporate as much seasonal activities that I can for my children. This one is so easy to put together. 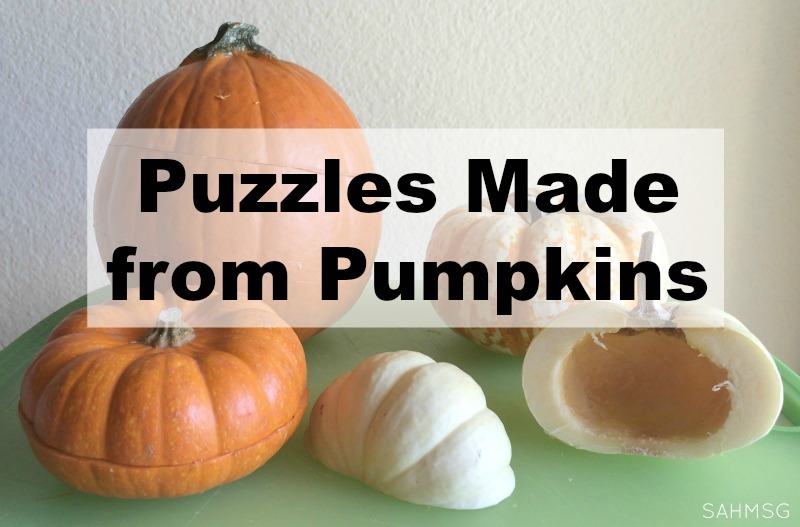 Make your own homemade puzzles using REAL pumpkins as a fun addition to your Fall Preschool Activities. 1.) 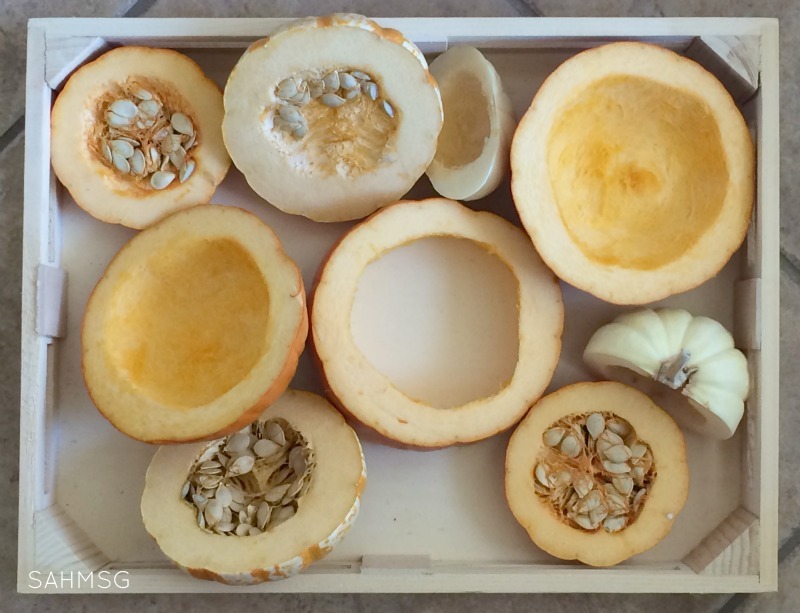 Cut the pumpkins in different ways: Cut 1 in half horizontally as shown in the picture above, cut another vertically like the little white pumpkin in the image below. I even cut one of the baking pumpkins into 3 pieces to add more challenge. 2.) 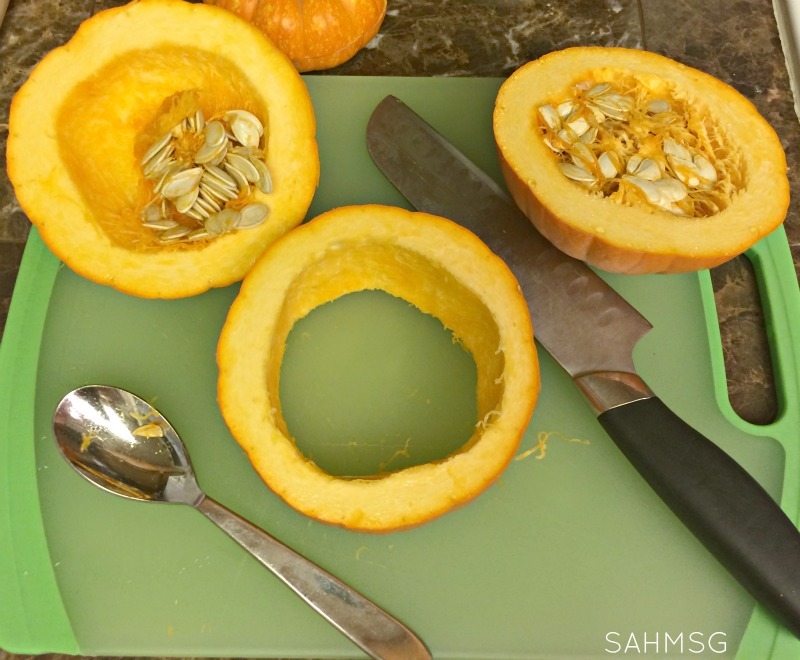 Clean out the seeds, if you like, using the spoon to scoop them out. (You can save these for a counting activity I will be sharing next week.) I left some seeds in a couple pumpkins for added sensory exploration. 3.) 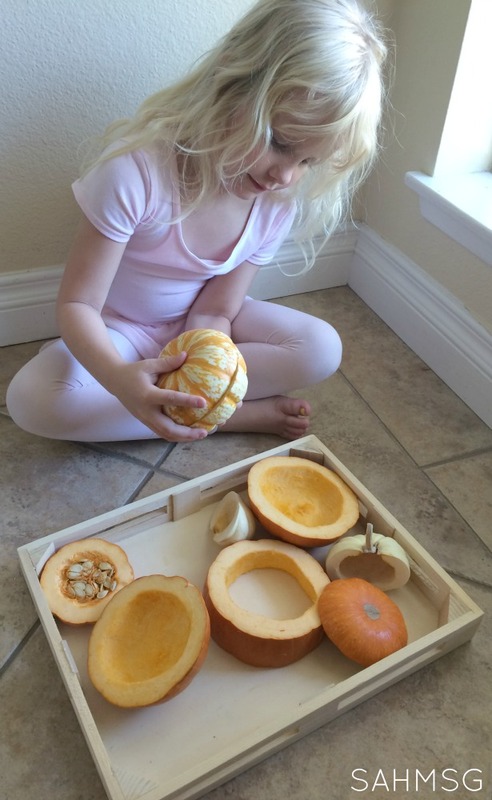 Place the pumpkin pieces on a tray and set it out as an invitation to play. My preschooler matched the pumpkin pieces together looking for matching colors and lines. I did help her look for marking on the pieces that might help her match them up exactly. It was a fine motor challenge to try to shift the pumpkin pieces so that they lined up just right with your matching parts. After matching the pumpkin puzzles, my oldest son wanted to check things out, so the two kids lined up the pumpkins in order form smallest to largest. You get three activities in one here, because picking at the seeds (if you leave any inside like I did) is a great sensory and fine motor challenge. The twins and my older two showed interest in poking into the pumpkin flesh and trying to remove the seeds. 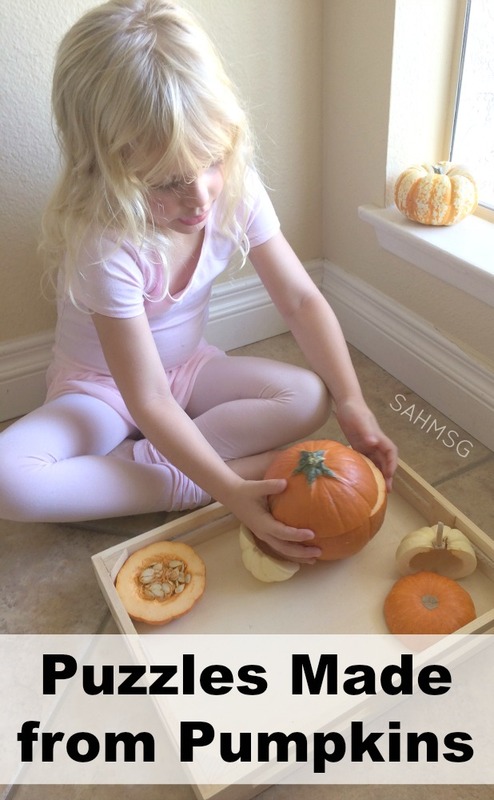 This activity will take you all of about 2 minutes to put together because the only prep is cutting the pumpkins. 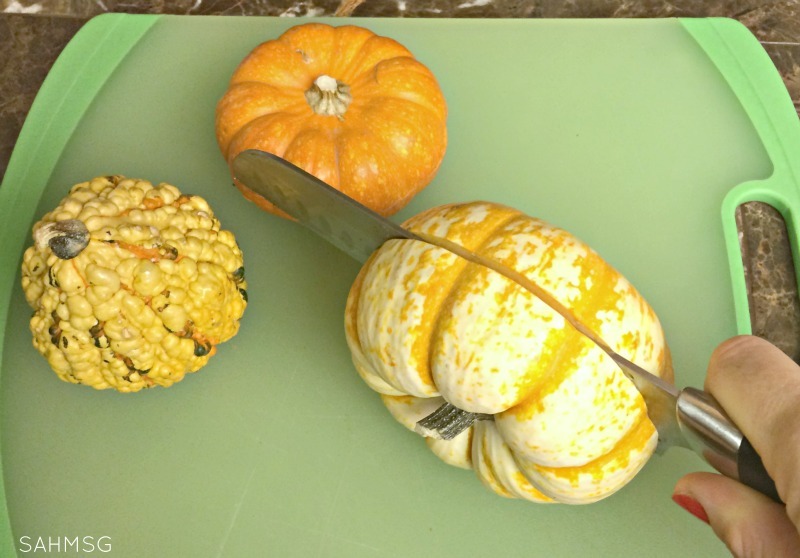 My warning about gourds: Many of us know gourds are hard to cut, nearly impossible-for me anyway. 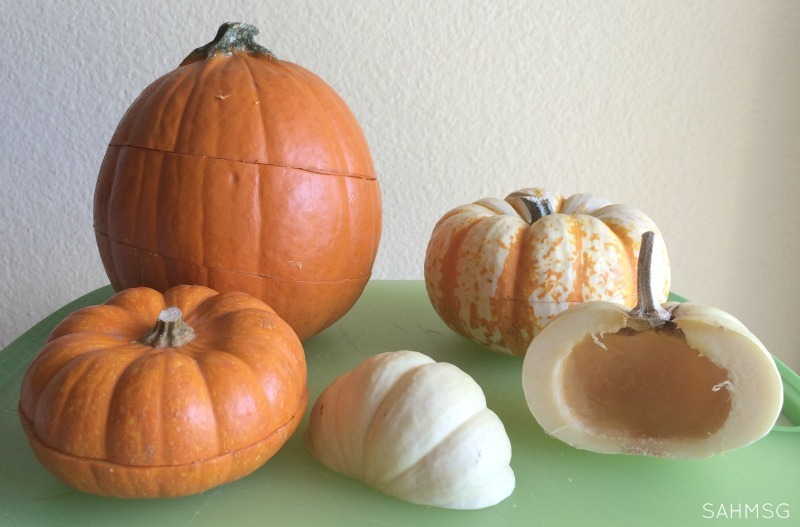 I tried to cut a bumpy gourd to add to this activity and the skin was just too tough. The knife slipped and I cut my finger. 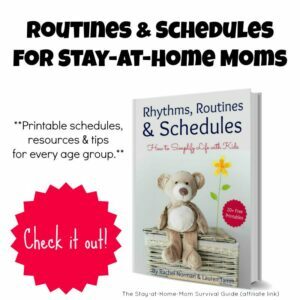 (The reality behind being a mom blogger!) Don’t try to cut any gourds. Use the smooth-skinned pumpkins. 🙂 That concludes my public service announcement! If you have younger children, I have a collection of Infant Activities for Fall that you should try. They are really simple ways to let the littlest ones explore the season. This collection of Halloween Activities and Crafts for Toddler and Up has how-tos for creating fun Fall-themed fine motor, counting, and general pumpkin fun as Toddler and Preschool activities. How have you been having fun this Fall season with your kids?